[Image: Andy Levin/Contact Press Images, for The New York Times]. New Orleans now has new gates of war – the war against natural hydrology: "They are monumental things, these structures, as tall as four-story buildings and as brutal as bad public art. 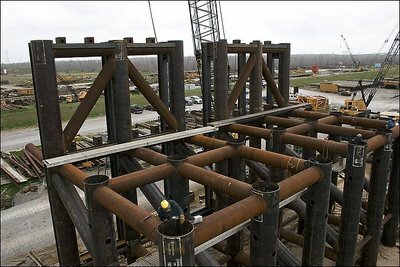 Each of them slightly resembles a giant's chair with massive steel lattices of pipe braced and welded every which way." The gates are being built for the Army Corps of Engineers. 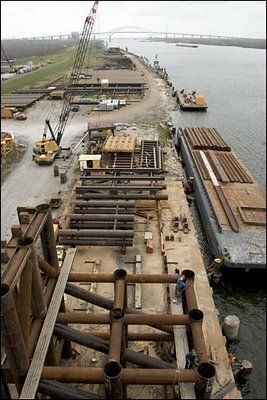 "Once the structures are in place, their steel gates, which will normally be raised, can be lowered and locked down before major storms to provide protection against a surge like the one that caused the canal's levees to fail during Hurricane Katrina. When the gates are closed, the lake's waters will not be able to rise against the canal's fragile walls." Read more about the gates at the New York Times; read more about military hydrology at BLDGBLOG.